Martyn Worms at Camberley International has been appointed worldwide central agent for charter of Mondomarine’s 40.5m motor yacht Blue Belle. Built in 2003, her original owner supervised the construction and paid particular attention to every detail during the three-year build period. Sleeping ten guests in a master, two VIPs and two twins Blue Belle is available in the Eastern and Western Mediterranean. 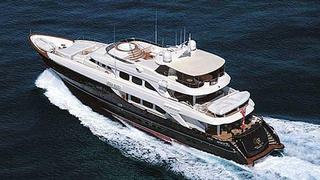 Weekly charter rates start at €95,000 in high season and €70,000 in low season.